by Fleisher, Craig S.; Bensoussan, Babette E.
CRAIG S. FLEISHER (Madison, WI) is a pioneering Competitive Intelligence researcher, author, consultant, and professor. He was inaugural chair of the Competitive Intelligence Foundation (CIF); Past President of the Strategic and Competitive Intelligence Professionals, and founding editor of the Journal of Competitive Intelligence and Management. He is now CLO at leading CI consultancy Aurora WDC. BABETTE BENSOUSSAN (Sydney, Australia) is a global leader in CI, strategy, and marketing who has coached, mentored, and trained executives and organizations throughout the aerospace, telecom, transport, finance, pharmaceutical, and utility industries. Their books include Strategic and Competitive Analysis and Analysis Without Paralysis. 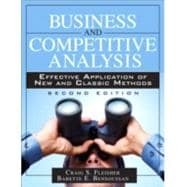 The definitive practical guide to business and competitive analysis, now fully updated: all the tools, step-by-step instructions for using them, and expert guidance on choosing the right tool for every assignment!